There are many Micro RC Quadcopters with camera you can now buy and it can be a difficult task to choose the best one. Today there are a lot of new and well made quads for you to choose from so we wanted to help get all of the information in one place. If you are a drone enthusiast and like to shoot photos and videos with your quad, you want to select the best micro quadcopter with camera which suits your requirements. With so many micro quadcopters in the market today, it is very important to choose the quad that will be able to last you through more than a few crashes. Here is a list of top 3 micro quadcopters which have a built in camera to help you capture beautiful images and videos. The Hubsan X4 H107C has probably needs no introduction. This amazing quadcopter has set the standard over the last two years and it gets listed time and time again as the best quadcopter to use for improving your piloting skills. This quadcopter is equipped with 4 impressive motors and it is known for its above-average power level. These motors have the adaptability to accomplish expert takeoffs and vertical climbs and they give a surprising level of acceleration and speed. 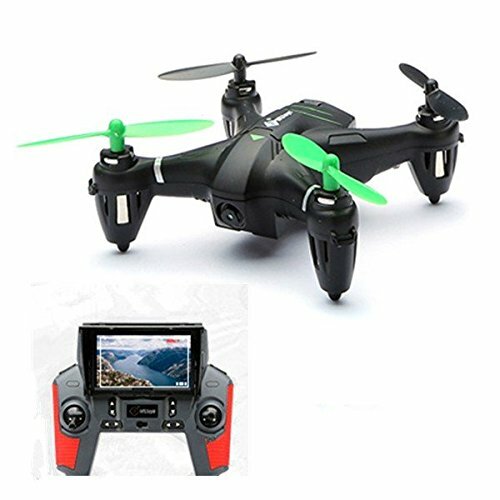 This micro quadcopter includes a 2MP 720p HD camera, PLUS an altitude hold system which greatly helps in steadying the quadcopter for aerial video. The Hubsan X4 H107C comes with a camera. Its HD 2MP camera lets you record and shoot incredible photos. However, you need to provide the SD card for it to store all your amazing captures. This Hubsan X4 also has 4 LED lights. These lights make your quad look cool and also make night flying easy. It is also equipped with 6-axis flight control system with modifiable gyro sensitivity. These features allow for a super stable flight. The radio transmitter is functional and pretty comfortable. The Hubsan X4 has two flight modes: Beginner Mode and Advanced Mode. Beginner Mode is for people who want to become professionals at flight basic. On the other hand, Advanced mode is for people who are more experienced. With this mode you can accomplish aggressive flips. This quadcopter can flip 4 ways – right, left, backward and forward. You need some extra accessories for the Hubsan X4 in order to get the maximum from your quadcopter. It is recommended to buy a good case to keep everything organized at one place and also to keep your quad during travel. Also, extra batteries are recommended because you don’t want to wait for the charge to finish. The Hubsan X4 is robust, extremely well made and amazing flying fun that never fails. The Syma X11C’s small size makes it simple to control and learn on. That’s why this quadcopter is perfect for hobbyists or those just starting out with quad flying. The Syma X11C uses a 3.7V 250mAh easily-removable battery that can be fully charged in around one hour. This battery provides a flight time of around 5 minutes. The quadcopter uses a 6-axis stabilization system for smooth flying. It also has stronger wind resistance for stability. These features allow the quad to be flown indoor as well as outdoor. The Syma X11C comes with a 2.0MP camera and that is the best part. This camera allows you to record videos and capture images while flying in the air. It also has a Micro SD 2GB memory card. This allows you to save the recorded media for convenient storage and transfer. This micro quadcopter can be controlled using a 4 channel 2.4GHz remote controller. This controller is simple to use and practice on. There are also LED lights on the Syma X11C’s body to make night flying easier. 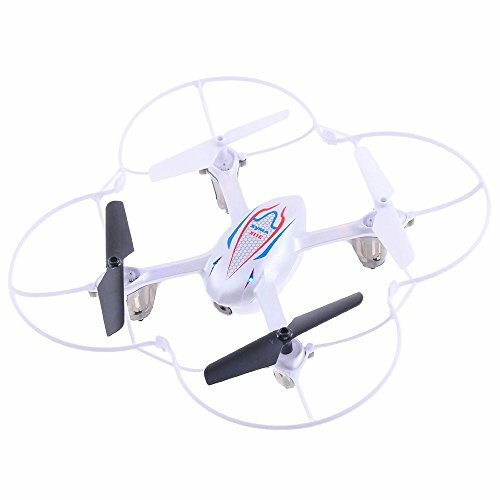 The Syma X11C can do different functions, such as 360 degree eversion, turn left and right, fly down and up, fly backward and forward and sideward flight. 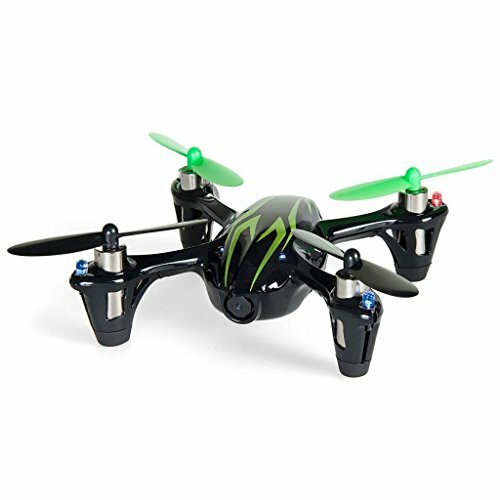 The WLtoys Q242G Mini RC Quadcopter RTF is an amazing small sized quad that is simple to fly and it is considered to be the perfect quadcopter to try for newbies. Its agile body also allows experienced pilots to perform amazing tricks without the difficulty that comes with flying large drones. The WLtoys Q242G can be flown indoors as well as outdoors. This quadcopter is equipped with a 6-axis gyros system that provides a more stable flying experience. It also comes with stronger wind resistance that makes it simple to control the quad. The quad’s lightweight frame with nice durability allow for flying features, such as 360 degree rolls. Flying moments include the Q242G going right, left, down, up, backward, forward and sideward. The WLtoys Q242G comes with a 2.4GHz wireless remote controller that features an LCD screen with 5.8G real-time photo transmission. This allows you to view and share photographs and videos at any time. It also allows you to adjust the quadcopter and camera settings as per your convenience. You can also review what is being recorded by the quad’s camera. This quadcopter comes with 2MP FPV camera that allows users to capture incredible videos and photos. This camera helps capture every amazing and unforgettable moment. The WLtoys Q242G uses a 3.7V 400mAh Li-Po battery. This is a Phantom designed flight battery. It is easy to remove it and put it back as well because it does not need any connecting cables. It has a flight time of about 10 minutes and a charging time of about one hour. This allows for easy and longer flight. This quadcopter even has LED lights on the body. This helps make it stand apart from other crafts and easier to recognize. Also, these lights allow you to spot the quad in the dark which makes night flying a lot simpler. Well, these are the top 3 micro quadcopters with camera. All of these seem like a heck of a lot of fun and they can help you capture every beautiful and unforgettable moment. Regardless of your choice we hope you find a quadcopter with camera that suits your needs. We hope this gave you a nice review of the best micro quadcopters with camera available on the market today.